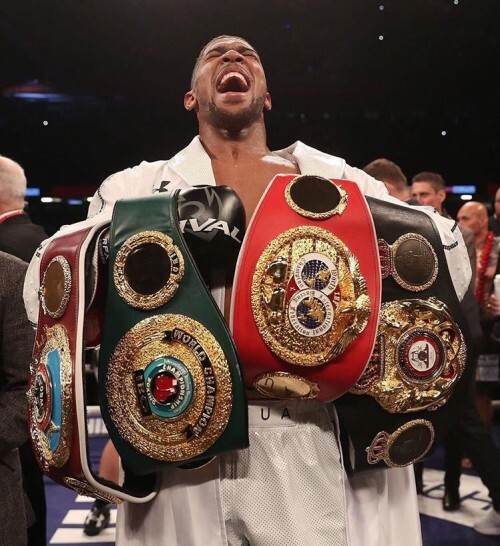 The WBA, IBF, IBO Heavyweight Champion of the world, Anthony Joshua by way of Britain collided with the WBO Heavyweight Champion of the world, Joseph Parker from New Zealand on Saturday night in Cardiff, Wales at the Principality Stadium. Two undefeated champions going head to head. The last time this happened was when Mike Tyson fought Tony Tucker over 30 years in in 1987. Funnily enough I often see Tony Tucker at the Mayweather Boxing Club in Las Vegas. Joseph Parker has had his training camps out here in Las Vegas also. He regularly goes to Sub-Zero Recovery, where I do my cryotherapy and normatec sessions. Anthony went the full 12 rounds for the first time and showed that he can do it comfortably. Many questioned his stamina but for this fight he came in 13lbs lighter and showed he’s ready for Tyson Fury and WBC Heavyweight Champion, Deontay Wilder. British boxing is flying right now. Promoters Frank Warren, Eddie Hearn and Nisse Sauerland have seen their hard work pay off. Roughly 80,000 fans packed into the Millennium stadium. The atmosphere looked electric watching from Las Vegas on Showtime. I was privileged to witness first-hand when Anthony fought the legendary Wladimir Klitschko at Wembley Stadium last year. 90,000 fans came out to support the Brit. I was also luckily enough to be at Carl Froch vs George Groves fight, when 80,000 attended. British boxing is in a great place right now and boxing promoters around the world are envious. Anthony is the perfect ambassador for British boxing and for boxing as a whole. He shows that despite coming from humble origins and not having the best start in life, you can still go on to great things if you find something to channel your energy into. With the growing knife crime and gangs in London and teenagers dabbling in crime. Anthony Joshua shows them it’s never too late to change from negative to positive. Anthony is always praising the Finchley Amateur Boxing Club for helping him get to where he is today. He regularly goes back to inspire the young there. Boxing is a fantastic sport to help troubled kids from inner cities. It’s only right I launch my very own, Treasure Boxing Gyms, as I’ve learnt so much from the All Stars Boxing Gym and Mayweather Boxing Club. I’d like to help the next generation be the best they can be. Well done Anthony. Congratulations on wining and for continuing to inspire many by your achievements and authentic personality!